Squash House Quilts: Maple Bar! Yum....creamy maple icing on top of donut dough - doesn’t your mouth just water? Have I got you thinking about a trip to the bakery? Well, sorry to tease you, but I’m actually talking about another type of bar! 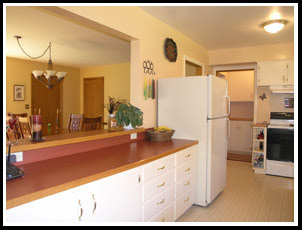 In the Squash House kitchen is a pass-thru to the living room/dining room area. Look at the photo below which came from the real estate listing. See the small counter above the larger counter in the pass-thru? There is a plant and a candle sitting on it. At first I was going to have the laminate removed and the same glass tiles for the backsplash placed down as the counter surface. I got to thinking that it might not be a smooth enough surface for drinks. We could wind up with quite a few spills onto the hardwoods below it, so I scratched that idea. Then I thought - why not put our builders skills as I previously showed here to work on something really creative? I floated the suggestion to Ted to use a piece of natural wood, preferably Maple (get it? - Maple Bar - LOL!) 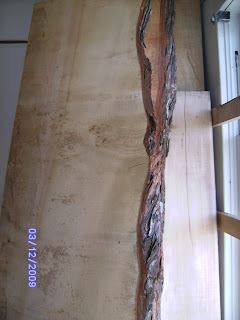 with the bark attached on the edge as the countertop! Ted liked the idea a lot - he said it was right up his alley! 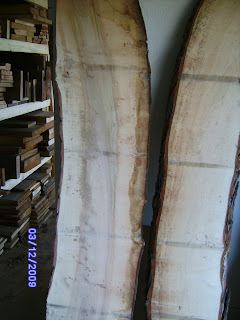 I searched all over the internet and came up with some interesting pieces of wood. Problem was, I couldn’t see them in person and if it was wrong after being shipped to us, we were stuck with an expensive piece of wood we couldn’t use. 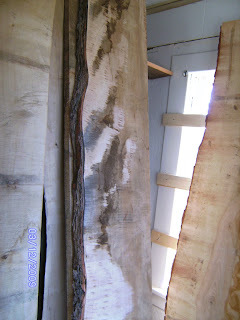 So Ted found a shop near the Squash House that carried natural Maple planks. You have to use your imagination when looking at these photos Ted sent. We need to choose one of these pieces. Once the wood is planed, then cut to size and installed, it will be highly polished and sealed, so some of the markings, such as the horizontal lines you see in one photo will disappear. 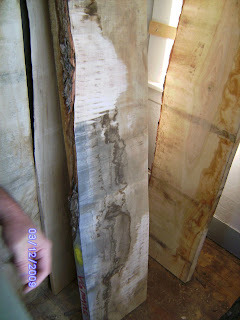 We also decided to leave the bark attached on just the living room side - the kitchen side will be smooth and finished. Work is still pretty busy for me, so I’m a bit behind in responding to emails and reading blogs. I did want to mention, as I know others have, if you have a question for me, please make sure to include a way to contact you back with an answer. On my last post there was a commenter who asked about a pattern for the pumpkin quilt in my header. I can’t reply as you posted Anonymously. Please email me from My Profile and I’ll respond to your question. Thanks! The thought of maple on dough doesn't do anything for me I'm sorry. I can't stand maple syrup, but the idea of maple on your counter top sounds divine. Is this for the new house or the one you're currently in? Maple bars were my favorite donuts as a child...now I'm having a craving...! Your home is beautiful! your counter is going to be amazing. I have never tasted maple syrup but I'm sure your maple bar will look beautiful. I wish I had maple in my home. I have old school oak. I love maple. This is going to be lovely. Isn't that beautiful! I love the color and the grain of maple. This will be a special touch. Wow, what a great idea for your countertop. That is going to look beyond cool! Love the idea of leaving the natural bark on part of your maple bar. :o) Squash House is going to be the most amazing place to live. What a clever idea! I can't wait to see it. It will bring a unique touch to your home that no one has! We have maple swirl ice cream that is really yummy. Your new counter is going to be fantastic. Candace, I like your idea with the bark attached. I would definitely vote against small tile for your counter. We have 2" tile on ours (there when we moved in) and it is so hard to clean. Any little spill gets in the grout, and forget rolling out dough! Although you might not be rolling out dough :) I think the would will be beautiful! I think it's going to look unique and rustic. What a great idea! The maple is going to look so warm and inviting once it's sealed. Plus it's a hard wood and should stand the tests of time. Mentioning Maple Bars has now made me want one!! Hi Candace, your counter is going to look great and I can't wait to see the finish project. Awesome piece for your counter. Great taste. Great idea...I know you'll let us see the completed maple bar - from both sides. Very cool idea Candace! You're so creative and it's going to look great!